[embedyt] https://www.youtube.com/embed?listType=playlist&list=PL3wVstrIXeqbyFZUerX9OrZ9MXRYfBgWf&v=wkFYrRa02dM[/embedyt]There are very few things I would wake up on a Saturday morning for, but when COO of Movemeback Oyin Solebo told me about this year’s theme at the LSE Africa Summit 2017 – ‘Built for Africa: African Solutions to African Issues’, and asked me to help out as a Movemeback Ambassador, I knew I had to attend. Corruption, poor infrastructure, health epidemics, religious extremism, gender disparity – I am more than familiar with the numerous challenges facing the continent, so I was excited to attend an event which side-stepped the usual negative narrative and provided a platform to showcase, celebrate and learn from the sophisticated, bespoke, and in many cases, home grown solutions that have been developed to tackle some of the most complex challenges on the continent. Despite the recent hope and talk of ‘Africa Rising’ at the beginning of the decade, the past year has seen a return to the status quo with challenges in North African states, Nigeria and South Africa at the forefront of Western mainstream media. 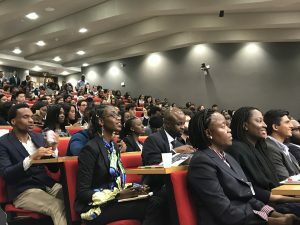 So I descended upon the LSE campus, in desperate need of some inspiration, anxious to hear about the progress and opportunities in the areas of services, trade and finance, and excited at the prospect of learning more about the journeys, successes and current work of the 2 accomplished – and, may I add, female – keynote speakers, Isabel Dos Santos and Ibukun Awosika. As soon as I entered the LSE building to register I could feel the energy; despite the early morning weekend start and elusive spring sunshine, there wasn’t a brooding face in sight. Decked out in their Sunday best on a Saturday morning, everyone seemed truly excited to be there. As I approached the front desk to register my attendance I could hear fellow attendees enthusiastically introducing themselves, discussing their backgrounds and sharing their reasons for attending the summit. “I want to know everything that’s going on in the continent, and where better to learn more than the LSE?” was the perfect proclamation of one attendant that I spoke to. Working with the Movemeback team afforded me with a front row seat at the summit where I was able to fully immerse myself in all the speeches and panels of the day. 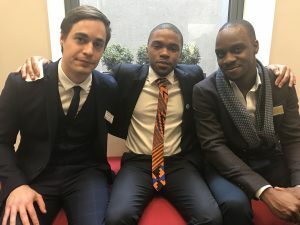 From here I heard about LSE’s leadership in African research, and the ambitions of Professor Tim Allen, Head of International Development to incorporate more African’s on the programmes reading list, a cause which I am a huge proponent of. From here I listened to the day’s first panel – ‘Improving Africa’s Service Economy’. Sylvia Mulinge (Safaricom), Derrydean Dadzie (DreamOval Limited) , Kwaku Osei (Linklaters) and Amos Ouattara (TaxiJet) revisited success stories such as MPesa, and identify the crucial obstacles around finance, human capital development, technology infrastructure, and policy initiatives. In this seat, I later witnessed the second set of panellists rethink Africa’s trade policies. Uzo Madu (What’s in it for Africa) chaired the discussion between David Luke (African Trade Policy Centre, UN Economic Commission for Africa), Roger Nord (IMF African Department), Anthe Vrijlandt (TradeMark East Africa) and Gertrude Nimako-Boateng (United Nations, International Trade Institute for West Africa) as they explored the potential of Tripartite Free Trade Area (TFTA) and Continental Free Trade Area (CFTA) and addressed the actions countries are taking to diversify away from commodities. I listened to the panellists’ frustrations around Africa’s absence in the global value chain, and mentally championed their pleas for policy makers to take trade policy seriously. John Ashbourne (Capital Economics) led the debate between Jude Addo (Standard Chartered Bank), Vivienne Yeda Apopo (East African Development Bank), Oscar Onyema (Nigerian Stock Exchange) and Linda Mabhena-Olagunju (DLO Energy Resources Group) on bridging Africa’s finance gap. I listened as they celebrated the well-established banking sectors across the continent, and the innovation delivered by countries such as Kenya with the success of the recent mobile Kenyan bonds – M-Akiba, while also challenging the effectiveness of local banks and mindset of investors who were reluctant to keep their money on the continent. From here I learnt about Isabel Dos Santos‘ regeneration activities in Angola, heard about the potential of agribusiness and energy sectors, and absorbed her wise words around having a plan, demonstrating a track record, and staying true to oneself in the pursuit of career success. And from this seat I was given the final dose of motivation by Ibukun Awosika as she gave the closing day keynote. Not only did she give me a reality check by telling me that I needed to stop talking and start acting, reminding me to start by solving problems and not creating products, and to start local by getting to know my people, she also reminded me that I am a leader of today and confirmed that I was just as smart as Mark Zuckerberg – my personal favourite. As a member of the Movemeback team for the day, I also supported their social media and wider press coverage, and more generally helped to execute their activities throughout the summit. As a result, I had the opportunity to attend the careers workshop, which they hosted with attendees of the conference. It was uplifting to hear Movemeback’s passion and faith in the continent, and their desire to use their work to move its development further along. In addition, hearing about the broad set of career and commercial opportunities which they delivered to their members – ranging from healthcare, finance and creative arts – was extremely encouraging, and helped to reinforce the point that Africa was not merely a destination for the aspiring messiahs of the world seeking to play saviour with their economic development work. Moreover, as someone intending to work and establish a business in Ghana in the future, I appreciated the valuable reminders about ‘having the right mentality’ when transitioning back, and felt reassured about the support initiatives offered to Movemeback members. Overall it was an uplifting workshop; it was fantastic to walk in a packed room of people, from all walks of life, with a universal passion for the potential of the continent, and an eager desire to explore a future in the region. It was great to meet peers that shared my aspirations, motivations, hopes and fears. I empathised with my peers’ desires to move back to explore new cultures, develop new skills and give back, and was more than familiar with the financial and cultural obstacles and parental discouragement many were contending with. By the end of the hour I felt as though I had formed my own mini-community, and better understood the unique power of the Movemeback platform and network. For me, Ibukun Awosika’s closing keynote speech perfectly summarised the positive yet realistic tone of the summit which made it such a success. The summit didn’t avoid or sugar coat the challenges which the region faces, yet it did showcase the opportunities inherent within such challenges by drawing on past and current successes, thus providing a well needed break from the usual narrative. 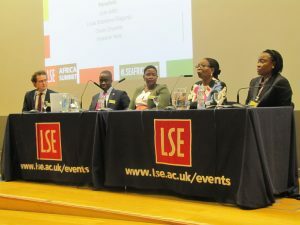 With that in mind I’d like to say ‘well done’ to the LSE for executing such a first-class event, helping to demonstrate what Africans are capable of and reminding attendees of the future potential of the continent. Good job and I cannot wait to see what you have in store next year!